We finally made it back to the farmer's market this week after missing a few. We were happy to see some baskets of beautiful tomatillos for sale. 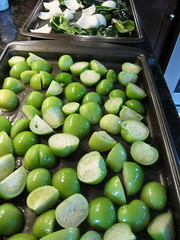 We grabbed two baskets right away along with some poblano peppers, onions, garlic and cilantro to make tomatillo sauce. 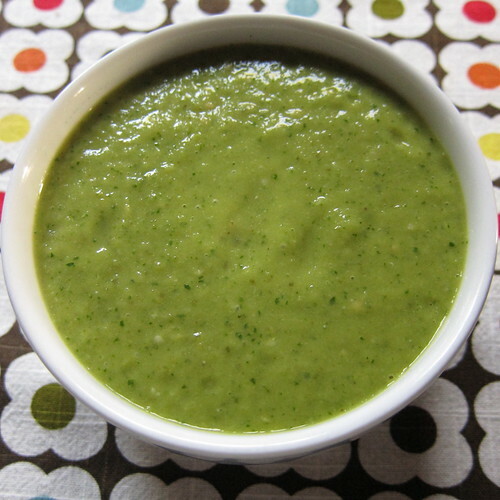 We like a tomatillo sauce to mix with chicken or pork for Mexican dishes, especially enchiladas. Typically, we make it on the stove, slow cooking it for awhile. This year Matt wanted to see how it turned out with the much easier oven roasting method I've been using for tomato sauce. It turned out beautifully. All the flavors are there and it is just so simple. The oven roasting makes it taste like it slow cooked on the stove. 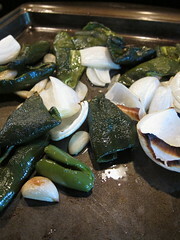 Put the tomatillos, onion, poblanos, jalapenos and garlic on a baking sheet (We need two.) Drizzle enough olive oil on to coat everything. Roast in the oven until everything is soft, about 45 minutes. The onions and peppers should have some brown on them. Let cool a bit. Put everything into a blender or food processor. Add the cilantro. Process until everything is puréed, it won't be completely smooth. If it is a little thicker than you like add 1/4 - 1/2 c water. Stir in the vinegar. Taste and add salt as needed. You can also play with this by adding other spices such as Mexican oregano, chili powder or epazote. We freeze it in one cup quantities. One cup is usually good to mix with meat, but we pull out two bags for something like enchiladas where it'll also be the sauce. Oooh, yes. I love using a tomatillo sauce to braise pork or chicken - it makes the BEST tacos, chilaquiles, etc. This has been on my mind all week - have to get to the farmer's market tomorrow! Yum! This looks really tasty. 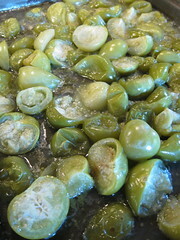 Ooooh, I have some tomatillos frozen from earlier this season. I'm thinking I can get them to work in this. It sounds so good! Love tomatillo sauce/salsa. Never did it in the oven though. I will try that the next time Kat! This was delicious and just what I was looking for! I loved the instructions. I'd like to pin this to my Pinterest board, so I can use it often, but you don't have that on here. I'm just curious as to why...and feel free to say that it's none of my business! OK, thanks for sharing; we are the beneficiaries! Lisa - Glad you liked it. The only reason there isn't a pin this button is last time I tried to add it, it didn't work. I should try again as that was awhile ago. But you can still pin it. Pinterest has a pin it button you can put in your browser bar that let's you pin anything. I have that & use it all the time. Stiv - 1 Tablespoon. I fixed the recipe, thanks for catching it.